NO Xplode New Formula Review – Does it Work? Is it Good? N.O.-Xplode has become a staple in my supplement stack after purchasing it now for second time and I don’t see that changing any time soon. 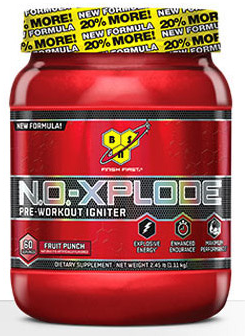 NO-Xplode has all the energy, focus, and pump that I look for in other pre-workouts without the anxiety, diarrhea, and chest pain some other formulas often cause. Not only did it exceed my expectations, it saved my wallet. The Tub of N.O.-Xplode I purchased lasts me about a month and a half of consistent use and warrants results and consistency more expensive pre-workouts simply haven’t been worth. The products weakest point is unfortunately one many of you may care about most, Taste. I would give the taste on this product a 3 out of 5. It’s not so awful that you’re going to dread going to the gym and having to take it, but it’s not good enough to crave throughout the work day. It has what I would describe as a carbonated water sort of taste. If you’ve ever had flavored sparkling water, this tastes like the Blue Raspberry version of those drinks. Again, if you are after quality in your supplements and results in your workout, I can recommend no product higher, but for picky eaters and those that workout purely for enjoyment, there are definitely tastier products on the market. For those of you focused on optimizing your workouts while minimizing caloric intake, this product is perfect for you. At only 40 calories there’s no reason this can’t fit your diet, macros, or meal plan. Besides the large amounts of Vitamin B present in most preworkouts, this product, like many others in the supplement market, uses a proprietary blend of ingredients in their formula. It’s difficult to gauge exactly how much of each ingredient is present in the product but you can definitely feel them working. The first time I tried it my hands tingled like crazy from the Beta Alanine, I suspect there’s a lot. If you’re the type of person who needs fire ants crawling over you to work up a sweat, this product is definitely for you. If you’re someone who sweats excessively already, this product tends to make me sweat more than usual, but certainly not profusely. Finally, the most important ingredient in any preworkout: caffeine. This pre-workout has caffeine dosed exactly where I want it, 250 mg. I like this dose for several reasons, its high enough that single scoop will get you pumped and going, but low enough that a second won’t kill you. It makes it easier not only to conserve preworkout, but to get in an extra boost when you need it. The results from this product are best measured in the gym and not necessarily in the mirror. Pre-workouts are not a wonder drug that make muscle grow any faster or fat slide right off, they’re a tool, and N.O.-Xplode is a good one. I find that I not only have more energy during my workouts but that I’m focused enough to make every workout more optimal. If you want to go in the gym everyday knowing you can do what you set out to, NOXplode is great. This product has given me a confidence in my approach to my gym that I hadn’t had in a while. Overall there are few supplements let alien pre-workouts I would recommend as highly. While the taste is tiring and hardly enjoyable, I think the performance I experience using it is more than worth it. Overall I would give this product a 4.5 out of 5 and recommend it to anyone that asked me what pre-workout they should get. To take advantage of the current discounts available at Amazon.com click here. Cannibal Ferox V2 Review – Does it Work?